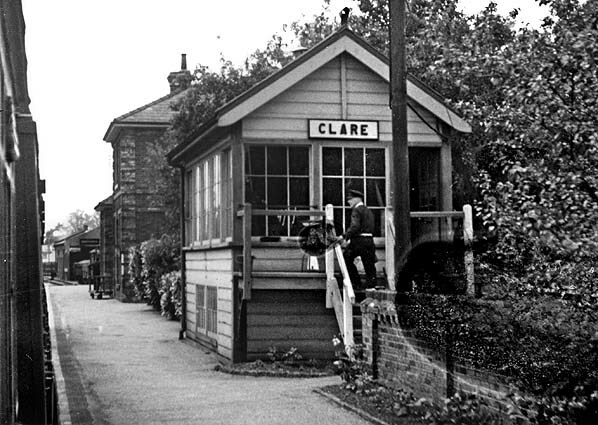 Present state: The station and goods shed have been preserved as part of Clare Country Park. All the station buildings are extant as is the goods shed which still retains a short section of track and a crane . The shed is now the visitors centre and museum for the country park. It houses a goods wagon which is displayed on the track during the summer. 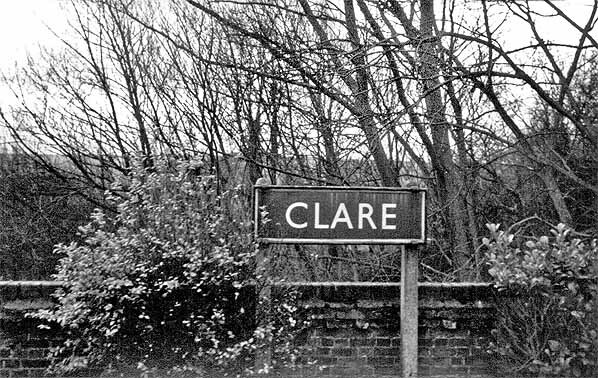 Notes: Clare was one of approximately 30 'GER 1865' stations built to a standard design. The GER 1865 type had a complete architectural uniformity for station buildings, waiting shelters, crossing keeper’s house and goods sheds, which even extended to joinery and ornamental brickwork, including a distinctive type of panelled brick walling used at the rear of the platforms. The style was modular in nature so that various combinations of basic elements could be used according to the requirements of the particular location. Clare was a medium size GER 1865 type with two facing platforms and a goods shed. The main station building was on the north (up) side; it had an H-shaped plan with the station master’s house forming the east (right) range, and the booking hall forming the central and west (left) ranges. There was a glazed canopy over the station entrance between the two wings of the building and a verandah on the platform side; this had a central opening and large windows above vertical weatherboarding. The building was of red brick laid in Flemish bond with gault brick dressings below a hipped slate roof. The booking hall had a central timber partition with the booking office next to the house and a public booking hall. The end section was the waiting room with an external extension for lavatories at the west end. On the opposite platform there was a waiting shelter. This had an open front flanked by large windows with vertical weatherboarding, similar to the verandah on the up platform; the weatherboarding was, at some time, replaced with brick on both the waiting shelter and the main building. There was bench seating around two sides and an open fire. There were two small rooms on either side of the open shelter; that to the left was a waiting room with a lamp room to the right. This building was also under a hipped slate roof with two chimneystacks. The station layout is shown on the 1904 1:2,500 OS map reproduced below. The goods yard was on the up side with one siding to the east serving a coal depot. There were also two timber storage sheds here. To the west side there were several sidings: one passed through the goods shed while another passed in front of it. From these sidings two further sidings ran east, either side of a cattle dock behind the west end of the platform. Cattle pens were sited on the dock. The goods yard could hold up to 50 wagons. No crane is shown on the map although the Railway Clearing House Handbook of Stations for 1904 lists a 1 ton 10 cwt capacity crane and this is shown at the east end of the goods shed on later maps. 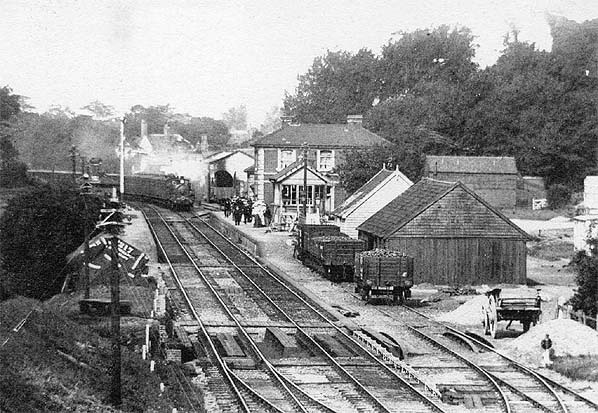 Initially there was no signal box but by the turn of the twentieth century a signal box was built on the up platform to the east of the station buildings. The 1957 1:2,500 OS map (also reproduced below) shows the storage sheds to the east of the station had been removed and the coal yard siding had been realigned at an angle to the main line. This happened sometime in the mid 1950s as the sheds were still there in 1953. 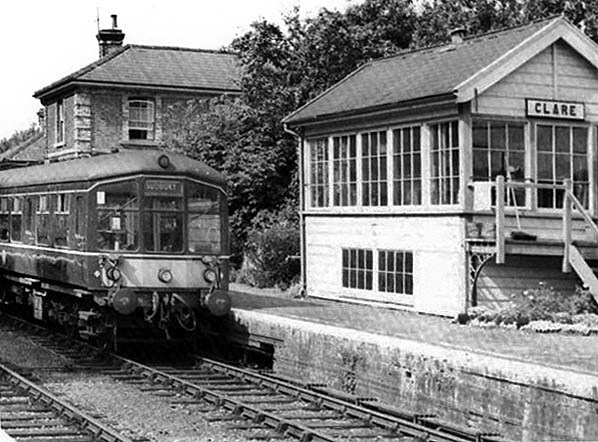 The signal box was destroyed by fire in the late 1960s and subsequently demolished. In June 1972 Clare Castle Country Park opened. The park comprised the thirteenth century motte and bailey castle earthworks and remains of the keep on 15 acres of land donated by Anthony de Fontblanque and 4½ acres of railway land with the station and goods yard on the inner bailey, bought for £10,000. The park is crossed by the Stour Valley Path. The goods shed was adapted as the country park visitors’ centre with the park ranger living in the station house. The goods shed still has its loading dock, and the roof is largely intact and consists of six trusses with a tie beam, principal rafter and king post. A short section of track was laid outside the goods shed. A goods wagon is kept in the shed and is brought out during the summer. In 2004 the 1865 type crane at nearby Glemsford was donated to Clare Station where it stands on a plinth outside the goods shed close to the site of the original crane. The park is owned by Suffolk County Council and managed by St Edmundsbury Borough Council. In 2012, owing to budget cuts, the county asked for proposals from groups interested in assuming ownership and management of the park. Clare Town Council has been engaged in lengthy negotiations with the county council and has now formed a group of trustees-elect to manage the park and buildings. Although the facility remains open to visitors, the park ranger was made redundant as a result of the cuts and the former railway buildings were boarded up. Local people concerned about the future of the buildings contacted historians at the Great Eastern Railway Society, and on the back of their research, an application was made to English Heritage to list the buildings. In February 2013 English Heritage granted Grade II listing both to the station buildings and the goods shed. The reason for listing is that Clare is now the only example of the GER 1865 type to retain a full set of buildings, i.e., the main station building with incorporated stationmaster’s house, platform shelter and goods shed. An application has been made by Suffolk County Council to make alterations to the inside and outside of the Grade II listed house, turning it into a two-storey residential property, an office and an education centre. Click here for the English Heritage list entry for Clare station building. This included a very detailed internal and external description of the buildings. Click here for the goods shed list entry. Looking west towards Clare station in December 1907 as an eastbound passenger train approached. The two timber buildings in the foreground are stores. Three wagons are seen in the coal yard siding on the right. The goods yard is seen beyond the platform. 1904 1:2,500 OS map shows the original track layout. To the east of the station a single siding served the coal yard; coal bins are seen in the centre of the yard. The cattle dock is seen immediately west of the station building with a siding running either side. Cattle pens are seen on the dock. The goods shed is seen to the left of the dock; one siding passes through it, another passes in front of it. A well is shown at the end of Station Road, just inside the yard. 1957 1:2,500 OS map. The only major changes are the to east of the station where the storage buildings have been removed and the coal siding relaid at an angle across the yard. Additional coal bins have been provided. The 1 ton 10cwt capacity crane is seen to the east of the goods shed. 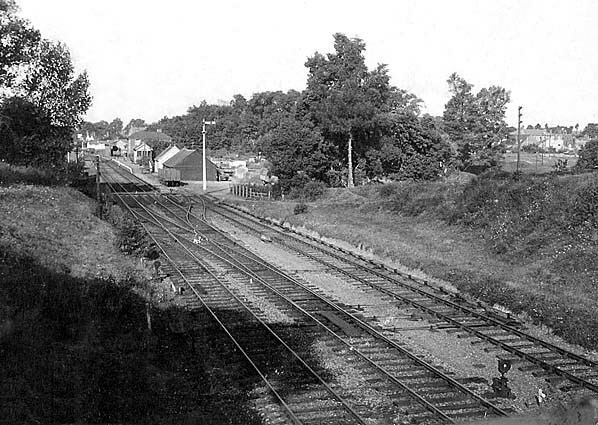 Looking west towards Clare station from Highfield bridge in 1947. The coal yard is on the right just before the platform; two coal wagons are seen in the siding. Within a few years the wooden sheds to the right of the wagons would be demolished. 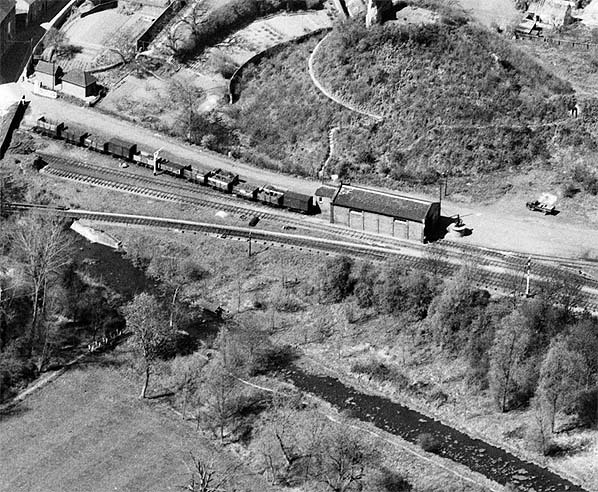 The west end of Clare goods yard in April 1953, One siding passes through the goods shed and splits into two sidings on the west side of the shed loaded coal wagons are seen here. Another siding passes in front of the shed. The small building at the west end of the shed was the goods clerk's office. The 1 ton 10 cwt yard crane is seen at the east end of the shed. Out of view on the north face of the shed there are two large opening accessed by a raised platform for loading goods from road vehicles. 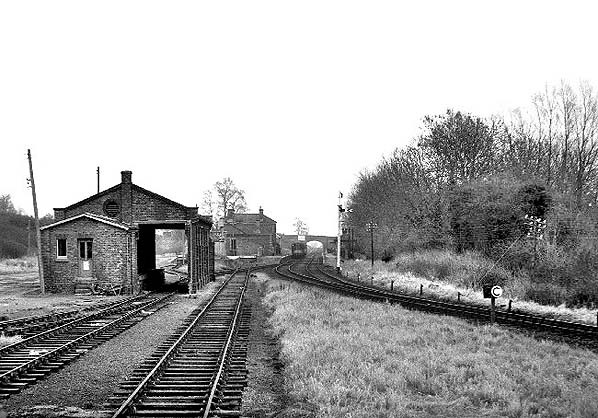 The main entrance to the yard was from the station forecourt but there was also a secondary entrance onto Malting Lane which is seen on the left. Clare Castle motte and the remains of the keep are seen at the top of the picture. Click here to see an enlarged version of this photograph. 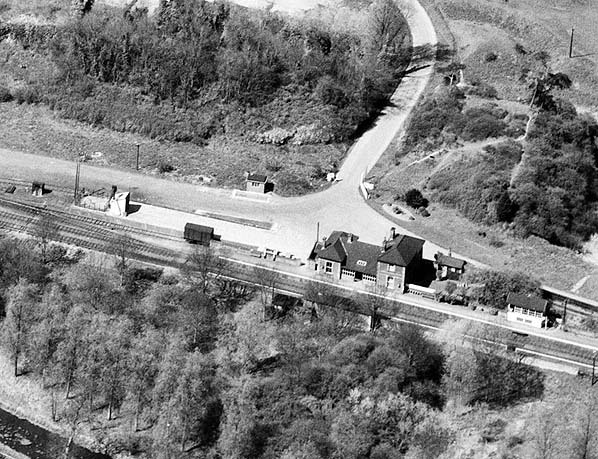 Clare station and cattle dock in April 1953. The main entrance to Clare station and goods yard is along Station Road which is seen coming in from the north. Turning right into the goods yard there is a weighbridge and an adjacent weigh office. To the west of the main station building the cattle dock is seen with sidings running both sides. Cattle pens are seen at the west end of the dock. The 'H' shaped station building is seen with a canopy between the two end wings partially filled in with wooden panels. The down side waiting shelter can be made out on the other platform. To the east of the station building the Clare signal box is seen on the platform. Click here to see an enlarged version of this photograph. 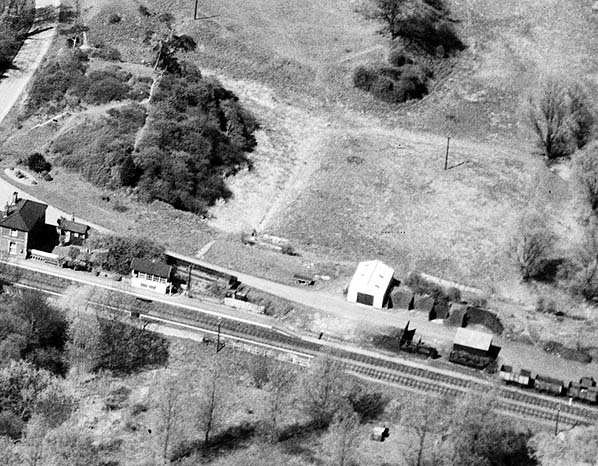 Clare coal yard is at the east end of the station and comprises a single siding; seen here in April 1953 with loaded coal wagons and coal bins to the rear. Two large wooden storage sheds are also seen. Within a few years these sheds would be demolished and the siding realigned. Click here to see an enlarged version of this photograph. An eastbound passenger train waits at Clare station in July 1956. 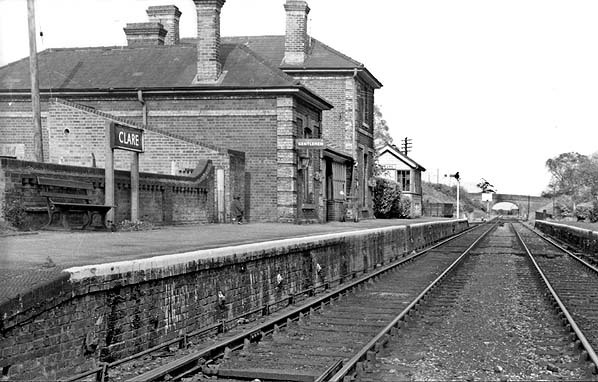 Clare station looking west c1959. The gents' toilet is seen at the east end of the building. The station building is 'H' shaped with a glazed canopy between the two wings. It is difficult to make out at this resolution but there is a totem sign fixed to the wall, below head height, just to the left of the canopy. It appears to be the only totem on the up platform. 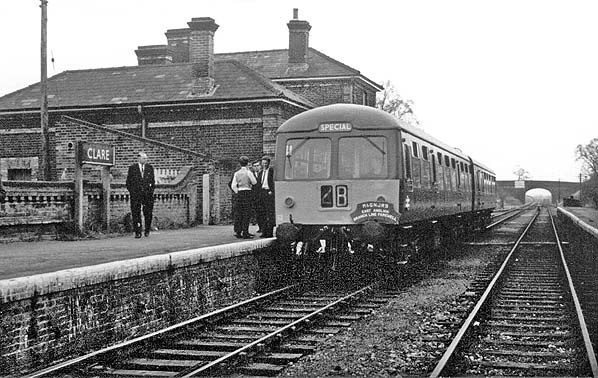 The 10.55 Cambridge - Sudbury service at Clare station on 30 August 1965 was formed by a Derby lightweight unit. 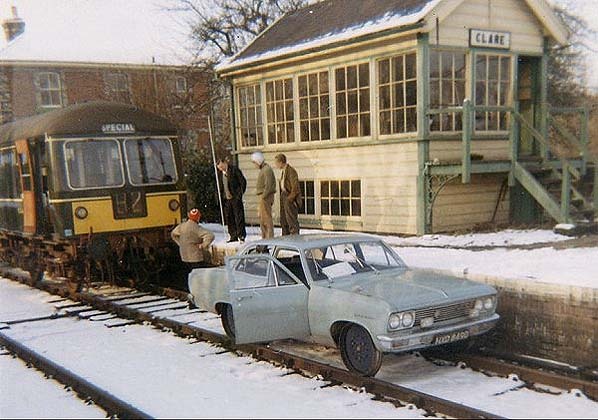 In January 1967 The Stour Valley line was used as the location of a TV commercial made by Shell petrol. A Vauxhall Cresta was used by the petrol company to prove their new mileage ingredient was more economical. Shell used a railway line because gradients were negligible. The Stour Valley was chosen because it was closed on a Sunday. For full details see the Railcar Association web site. One of the blue BR Eastern Region running in boards on the down platform in March 1967.